Although the first conductors were themselves composers, the wearing of both hats at the helm of a symphony orchestra is always cause for comment. 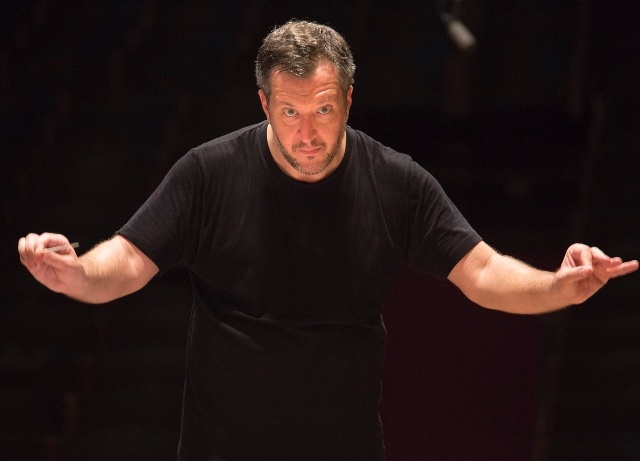 On Wednesday night, the British composer Thomas Adès, who is currently in the new role of "Artistic Partner" with the Boston Symphony Orchestra, led that band at Carnegie Hall in a program featuring the New York debut of his Piano Concerto. Adès made his reputation back in the 1990s with Powder Her Face, a caustic modern opera about sexual mores. he has carefully maintained that bad-boy image through a series of orchestral works and further operas, most recently The Exterminating Angel at the Met. This concerto is his second piece for the combination of piano and orchestra but his first to be properly numbered. It is in the traditional three movements. The soloist at this performance was Kirill Gerstein, and he had a hefty task. His piano spoke volumes, thundering against orchestral fanfares and a series of quirky march rhythms, engaging in terse dialogue with tuned percussion like the glockenspiel and xylophone. Gerstein's steely attack and forceful performance reminded one of concertos by 20th century Russian composers, but Mr. Adès' continued and inventive use of the orchestra's full capacity reminded one that this was a new work. The second movement slowed matters a bit, adding lush and eerie textures to the sonic tapestry. Here, the soloist was faced with the task of hewing graceful curves out of the marble slabs presented in the first movement. The free-roaming piano part found itself in thickets of woodwinds and strings before returning from that overgrown path and restating the thematic material in a traditional manner. Adès and Gerstein ended this collaboration with a burst of pell-mell energy that built into a series of increasingly raucous variations. The percussion section found itself working overtime as piano and xylophone now doubled each other in a discordant but clever unison. One was reminded of how certain rock musicians incorporate this same idea: descending, doubled arpeggios that build in power and volume, barrelling forward in a freight train of sound that leaves the listener flattened and awed. Shock and awe are words that well describe the opening of Tchaikovsky's Fourth Symphony, a staccato blast of trumpets that returns like an unloved visitor throughout the work. Adès aimed for raw, primal energy in this work, whether in the slow lilt of the slow movement, the brilliant pizzicato movement that comes through on little cat feet or the thunderous finale, in which a bold and determined march does battle with the triumphant fanfare. It wasn't anything subtle, but neither is this music. The concert started in a pianistic vein with an orchestral treatment of Franz Liszt's first Mephisto Waltz. Adès whipped daemonic froth from the orchestra, generating ferocious rhythms from the low strings to support violins and harps. The Boston players responded with enthusiasm to his leadership: not technically precise but imbued with a vigor and energy that might be missing from a more delicate conductor. (Reprinted by permission, Superconductor).